So, it was my birthday a little while ago, and my lovely family gave me an InstantPot electric pressure cooker. I will admit it wasn’t exactly love at first sight; I saw the words “microprocessor controlled” on the box and was immediately skeptical. The picture confirmed my suspicions. There were about a dozen different buttons on the front for all manner of automatic cooking: rice, meat, beans, slow cooker, congee. It reminded me of our old microwave which had similar buttons all over the front which never really worked properly, and which were for foods we didn’t actually cook. 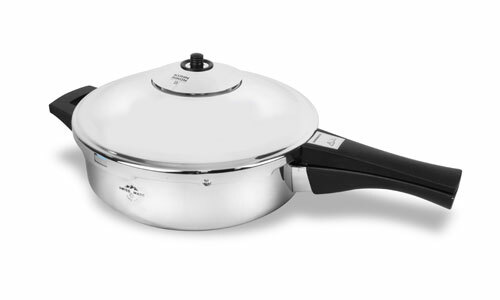 When I asked for a pressure cooker I was imagining something like this – something simple and elegant, which sits on the stovetop and is european-made. 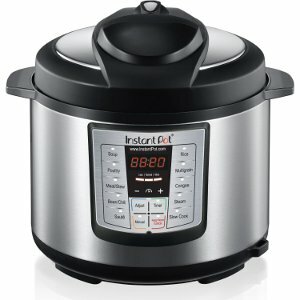 The InstantPot is neither elegant nor european-made, but you know what? After trying it out several times, it does what I want it to do. It cooks beans quickly, it makes great soups, and I don’t have to worry about forgetting about it and having a pressurised bomb on the stovetop. I put in the beans and water, push the Beans button, and walk away to do whatever else I need to do. I had the same concerns about the BlendTec blender – why does it need to have all the individual setting buttons right there on the front? But you know what? They actually work. The smoothie button makes great smoothies. The juice button makes great almond milk. The batter button makes great pancake batter. I may never make congee in my pressure cooker, but I guess I’ve never made soup in my blender either. I think part of my initial resistance comes from the desire to have the exact same toy all the other cool kids have. But my husband, who generously chose both of these appliances for me as gifts, knows me pretty well after 13 years. He knows that remembering to attend to things cooking on the stove is a challenge for me – one that I am continually improving on, but still a challenge nonetheless. If I still burn rice sometimes, maybe a microprocessor controlled electric pressure cooker is actually a safer and better choice for me than a stovetop version, no matter how elegant. He is also more immune to whether or not an object has crunchy cred, which I, unfortunately, am not. At least, not yet. I would probably have chosen the more expensive Vitamix because all my favourite crunchy bloggers have one, instead of the slightly-cheaper-but-still-awesome BlendTec. Of course, these are the same kind of things I was concerned about in Junior High…. just replace the words “blender” or “pressure cooker” with “jeans” and “shoes”. Sometimes I feel like I’ve come a long way since then, and other times I realize that my 12 year old self is still hiding out in my adult brain, waiting to covet expensive things my friends have and I don’t. Which is totally dumb because my adult brain is quite capable of seeing and appreciating just how awesome life is for me, and that I am in no way suffering from any lack. In fact, I was quite capable of cooking nice bean dishes with an ordinary pot, and now I have an appliance that makes it even easier for me. It just has a lot of buttons on the front.